I used to get quite disappointed when songs I really liked didn't go higher on the chart. And then I reached a certain point where I kind of liked the fact that I was into music not everyone else had discovered. But back in 1984, I would almost take it personally when what I saw as a good song failed to live up to my expectations. 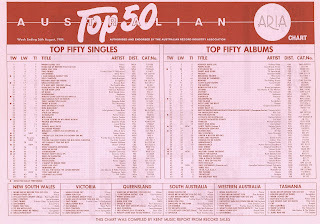 This week in 1984, every new entry on the ARIA chart ended up disappointing me - in terms of their ultimate peak positions, that is. A song that couldn't have gone any higher ascended to number 1 this week in 1984. "When Doves Cry" by Prince interrupted Wham! 's run at the top... but not for long. What a shock this was. Yes, This Island had already spent a considerable amount of time in the upper reaches of the albums chart, but this energetic follow-up to "Heaven (Must Be There)" should really have been much bigger. In the UK, "You Take Me Up" outdid both "Hold Me Now" and "Doctor! Doctor!" 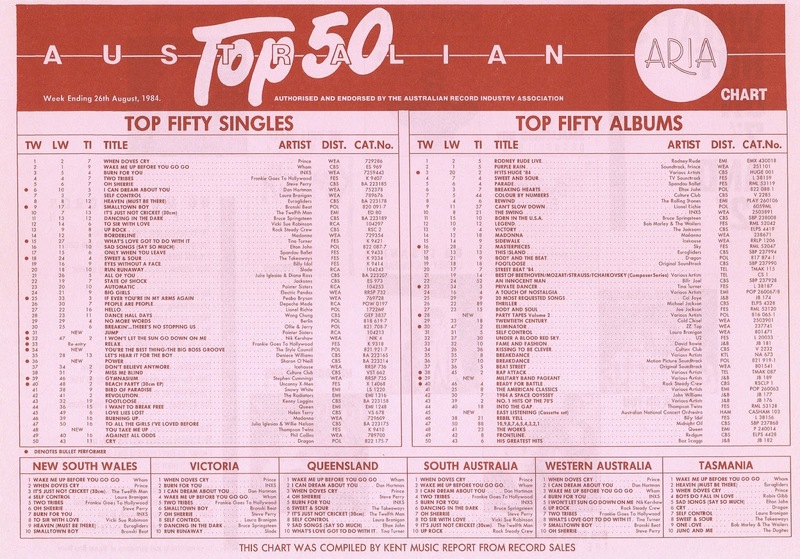 to peak at number 2 and become Thompson Twins' highest-charting single ever, but in Australia, the trio could only take themselves up one more spot from this entry position. Unlike those earlier two singles, "You Take Me Up" brought a new element to Thompson Twins' synthpop sound: the African-American work song, which fitted in neatly with the lyrics about "working in factories and sweatshops... the modern forms of slavery", according to singer and co-writer Tom Bailey. While I don't think the song deserved to peak above than the band's previous two singles, it should've reached a good 20 or 30 places higher. The theme tune she'd written for TV series Sweet And Sour jumped into the top 20 this week, but this song written and performed by Sharon O'Neill proceeded no further despite being a) a brand new release and b) really quite good. "Power" would end up as Sharon's final release for CBS Records, with whom she became entangled in a lengthy legal dispute over the next couple of years. By the time she returned with a new record deal and album in late 1987, the momentum she'd gained at the start of the decade was lost and she only achieved one more top 40 hit with "Physical Favours" (another song that should've done better than it did). Speaking of reaching the top 10, you might think this single by The Pointer Sisters did pretty well to achieve that, especially given it flopped earlier in the year when it was initially released. But, really, "Jump (For My Love)" should've been a number 1 hit. My second favourite single from 1984 - and one of my 20 favourite songs of all time - the dance-pop anthem never fails to give me a lift. My favourite bit is around the three-minute mark when it segues from the "Xanadu"-ish middle eight into the key change - one of pop's best ever moments. Somewhat surprisingly (or not, since key changes have become a bit passé), that modulation was omitted from the Girls Aloud remake in 2003. "Jump...", which had the "(For My Love)" bit added to the title to avoid confusion with Van Halen's "Jump" was also a top 10 hit in the UK and the US, where its use of footage of athletes doing as they were instructed was a nice tie-in to that year's Los Angeles Olympics. Next week: a single that didn't do as well as you'd think given it's one of the most popular songs by a beloved Australian rock band. Plus, a track named after a movie that didn't end up getting used in the film. What a terrific week for new entries. I agree that all should have peaked higher, but for me the most frustrating was Eurogliders falling just short of the top 50. Do they start doing "songwords" on the printed sheets soon? I have vague memories of this being one. "And then I reached a certain point where I kind of liked the fact that I was into music not everyone else had discovered" - ha ha, the original hipster. I was similar - it was nice liking things that weren't everyone else's fave. Don't think I've heard the Eurogliders track before. While I don't think it's that great, surely coming off the back of 'Heaven' it could have at least scraped the top 30. Don't think I'd heard 'Power' before, either. Looks like a relatively high budget video for a (sort of) Australian release at this time. 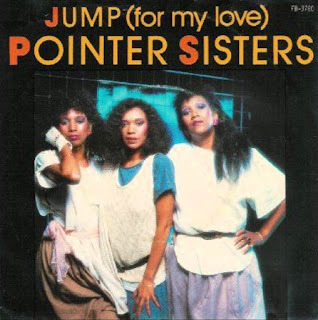 I prefer 'I'm So Excited', 'Neutron Dance' and 'Dare Me' to 'Jump...' when it comes to Pointer Sisters.